"The gayatri mantra will excite us to be mindful about Srimati Radharani's lotus feet, to obey her orders." "Radha-dasyam, the service of Srimati Radharani, is the ultimate meaning to be extracted from the gayatri mantra." "Above the three planes of mundane experience, bhu, bhuvah, svah is the soul, savitur, who shows us everything just like the sun. Above the soul is the supersubjective plane which is varenyam, most venerated and worshipable. That worshipable plane of existence is called bhargo, brilliant and illuminating. The supersubjective area, bhargo, is the plane known as the svarupa-sakti which is the internal pleasure potency of deva, Krishna, Reality the Beautiful. That bhargo is His own divine potency Srimati Radharani. Let us meditate upon the lotus feet of Srimati Radharani, whose extended self and essential nature, mahabhava, is the svarupa-sakti, and who enthuses our capacity of devotional service. Let us surrender unto Her divine service." What is the meaning of gayatri ? The word gayatri is a combination of two Sanskrit words: ganat (what is sung) and trayate (gives deliverance). This means, "A kind of song by which we can get our salvation, relief, emancipation. Gayatri is known as veda-mata, the mother of the Veda. If we examine the Vedic conclusion from it's most condensed aphorism to its most extensive expression, we shall find that it begins with omkara : the Vedic symbol OM. 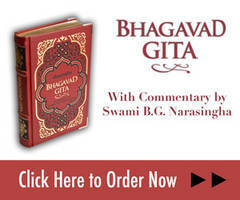 That truth is expressed as the gayatri mantra, then it appears in the form of the Vedas, and then as the Vedanta-sutra. Finally, the Vedic conclusion is given its fullest expression in the Srimad-Bhagavatam. Since the meaning, the purpose of Vedic knowledge progresses in this line, the gayatri mantra must contain within it the meaning of Srimad-Bhagavatam ---that is, that the Krsna conception of Godhead is the highest. This must be the meaning of the gayatri mantra, but the problem is how to extract Srimad-Bhagavatam-----the Krsna conception------ from within the womb of gayatri. I heard that Jiva Goswami has given such an interpretation, but I could not find where it is written. I heard that he has given the meaning of gayatri leading to Krsna consciousness. Anyhow, the tendency awakened in me to draw the meaning to the Krsna conception. The general meaning of gayatri is "that song which grants liberation." Liberation must have some positive meaning. Liberation means not freedom from the negative side, but positive attainment. This is the definition given in Srimad-Bhagavatam : muktir hitvanyatha rupam svarupena--- unless and until we attain the highest possible positive position, real mukti, real salvation, has not been effected. Mere withdrawal from the negative plane cannot be called liberation. Hegal has said that the object of our life is self-determination. We must determine our normal function in the organic whole---not mere emancipation in a positive function in the domain of service. This is considered to be the highest attainment of life. This is the real meaning of gayatri. The purport of the brahma-gayatri is as follows: The first word is OM. Om is the seed mantra which contains everything within it. The next word is bhur. Bhur is where we are--Bhu-loka-- the world of our experience. The next word is buvah. Buvarloka is the world of mental acquisition. It is the support, the background of our experience. Our present position of experience is the effect of our mental acquisition. That we are here in the world of experience is not an accident; we have acquired this position by our previous karma. The physical sphere, this present world of experience, is only the product, the outcome of our previous mental impulses. And the subtle world of previous karma, the mental sphere, is known as Bhuvarloka. The next word in the mantra is svah. Above Bhuvaloka is Sva-loka. The mental world (Bhuvarloka) means acceptance and rejection: what to do and what not to do--"I like this, I don't like that." Sva-loka, however, is the plane of decision, the world of intelligence (Buddiloka). Our intelligence tells us, "You may like this, but you don't do that, for then you will be the loser." That plane, the plane of reason, is known as Sva-loka. In this way, this material world is composed of three general layers, bhur, the physical world, bhuvah, the mental world, and svah, the intellectual world. Of course, a more detailed analysis will reveal seven layers: Bhur, Bhuvah Svah, Maha, Jana, Tapa, and Satyaloka. This has been dealt with in detail by Sanatana Goswami in his Brhad-Bhagavatamrtam. Here, these seven strata have been summarized in three planes of existence: physical, mental, and intellectual. And these three planes of experience have been summarized in a word, tat. The next word in the brahma-gayatri is savitur. Savitur generally means surya, the sun. And the sun means, figuratively, that which shows or illuminates; that by which we can see. The three gross and subtle strata within this world are shown to us by a particular thing, savitur. What it that? The soul. Actually, the world is not shown to us by the sun, but by the soul. What really gives us perception and allows us to see gross things? It is not actually the sun that helps us to see; we see with the help of the soul. This is found in Bhagavad-gita (yatha prakasayaty ekah krtsnam lokam imam ravih). The soul reveals this world to us just as the sun does. The sun can show color to our eyes, the ear can reveal the sound world, and the hand can reveal the touch world. But really in the center is the soul. It is the soul who gives light to this world, who gives us an understanding of the environment, the world of perception. All perception is possible only because of the soul. Here, the word savitur, which generally means sun, can only mean soul, like the sun, shows us everything. All seven strata of our existence-represented by bhur, the physical plane, bhuvah, the mental plane, and svah, the intellectual plane-have here been reduced to one entity: tat-"that." "That" is shown by the sun which in this context indicates the soul. Here soul means individual soul. The individual soul is the cause of his world. Not that the mind is in the world, but the world is in the mind. Berkeley has said that the world is in the mind. Here it is being expressed that everything is seen with the help of the sun. If there is no sun, everything is dark- nothing can be seen. So without light, nothing can be seen. And in a higher sense, light means the soul. The soul is the subject and the soul's object is the seven planes of experience within this world. The next word in the gayatri mantra is varenyam. Varenyam means puja: worshipable, venerable. This indicates that although within this plane--the objective world--the is the subject, there is another domain which is to be venerated and worshipped by the soul. That is the Supersoul area. That worshipable plane of existence is known as bhargo. Bhargo means the super subjective area, the area of the Supersoul. This is mentioned in the first verse of Srimad-Bhagavatam: dhamna svena sada nirasta-kuhakam satyam param dhimahi. Srila Vysadeva says that here he is going to deal with another world whose pristine glory is so great that by its own ray, all misconceptions are brushed aside. The subject is the soul, and its object is all these worlds of experience. And the super subject, is the venerable area which is superior to the subject, the soul-- that is the super subjective area. The word bhargo means"more subtle than the soul," and "holding a more important position than the soul." So this means the Supersoul, the Paramatma. In general, of course, the word bhargo ordinarily means light. Just as an X-ray can show us what the ordinary eye cannot see, bhargo is svarupa-sakti: higher, more powerful light that can reveal the soul. And that energy--bhargo--belongs to whom? It belongs to deva. What is the meaning of the word deva? Deva means "who is beautiful an playful," that is, Sri Krsna: Reality the beautiful. He is not a nondifferentiated substance, but is full of lila, pastimes. Deva means pastimes and beauty combined and this is Krsna. His domain is bhargo, brilliant, and it is varenyam, to venerated by the jiva soul. What is the nature of the svarupa-sakti? It is the vaibava, the extend body of Srimati Radharani. She holds the full service responsibility and the energy to serve Krsna. bhargo is no less than the vaibava, the extended body of Srimati Radharani, which contains everything for the service of Krsna. Bhargo represents Mahabava, the predominated moiety, and deva, Krsna, is Rasaraja, the predominating moiety. In the gayatri mantra, we are requested, bhargo devasya dhimahi: "come meditate". What sort of meditation is possible in that plane of dedication? Not abstract meditation, but service cultivation, krsnanusilanam. Dhimahi means " to participate in the spontaneous flow, the current of devotion in Vrndavana." And what will be the result (dhiyo yo nah pracodayat)? The capacity of our cultivation will be increased. As we serve, a greater capacity and willingness to serve will be given to us in remuneration-- just as interest is added to capital in the bank(dasa kari' vetana more deha prema-dhana). In this way, our dedicating principle will be increased again and again. Dhimahi means aradhana, worship. It cannot but be explained in terms of aradhana, puja, seva-- worship, adoration, loving service. The word buddhi means that which we cultivate with the help of our intelligence. But here, dhi is a reference to that venerable intelligence which descends into this plane to help us cultivate service. So dhimahi does not mean abstract meditation, but devotional service. This is the underlying meaning of the gayatri mantra. Gayatri, the song of deliverance, also means sankirtana. Kirtana is also sung, and it also improves us towards the highest goal. The sankirtana of Sri Caitanya Mahaprabhu also reinstates us in out highest serving position. So brahma-gayatri in connection with Mahaprabhu comes to mean krsna-kirtana. Then it reaches Vrndavana and the flute-kirtana. And when we enter Vrndavana, we shall find that the sweet sound of Krsna's flute helps to engage all the Lords servants in their respective duties. When the flute is sounded, the gopis and others are adjusted in their respective duties. At night, the gopis, hearing the sound of the flute will run to the Yamuna, thinking, "Oh, Krsna's is there." And when Yasoda hears the song of Krsna's flute, she thinks, "My son is there. He is coming home soon." In this way, the sound of the flute engages all the servants of the Lord in their respective positions and inspires them to be mindful of their service. In my Sanskrit commentary on the gayatri mantra, I have written dhiraradhanam eva nanyaditi tad radha-padam dhimahi : All other services are represented fully in Radhika. Like branches they are all part of her. Madhura rasa is the chief or mukhya-rasa, the combination of all rasas. Srimati Radharani is Mahabhava--she represents the entire serving attitude. The flute-song of Sri Krsna, expressed as the gayatri mantra, is reminding us and engaging us in our service. And what is our service? Our service must be to surrender ourselves in the service of Srimati Radharani-to accept the suggestion of Radharani. The gayatri mantra will excite us to be mindful about Srimati Radharani's lotus feet, to obey her orders. She is mainly representing the whole service area. So to try to engage ourselves in her service, under her order- to accept her direction and to obey her- that is the service of Sri Radha. In this way, the meaning of the gayatri mantra has been drawn to radha-dasyam, self-determination (svarupena vyavasthitih ). In the meantime, the partial representations in vatsalya and sakhya rasa are also part and parcel of the original mellow of conjugal love, madhura rasa. The vatsalya rasa devotees will serve Nanda and Yasoda, the sakhya rasa devotee will serve Sridama and Sudama, but ultimately, the whole system in one conception is included in Radharani. Radha-dasyam, the service of Srimati Radharani, is the ultimate meaning to be extracted from the gayatri mantra. That is the supreme end of our life. It cannot but be so. Srimad-Bhagavatam is the ultimate or full-fledged theism to be extracted from the Vedas, Upanisads, and so many scriptures. All the revealed truth rises to its acme, to its highest position, in the conception given by Srimad-Bhagavatam. And Srimad-Bhagavatam teaches us that the highest realization, self-determination, is the service of Srimati Radharani-that under her guidance we may serve Sri Krsna. We aspire for a direct connection with her service. What, then, is the inner meaning or purport of the word bhargo? Bhargo means the sum, or "who shows us by light." Radharani is the daughter of Vrsabhanu. I have selected the word bhanu. To represent her personal extended self, I have given the word vaibhava. Vaibhava means, "what comes out," or "extended self." Prabhava is the central representation and vaibhava is the outer extension. The very gist of svarupa-sakti is Srimati Radharani, and the whole svarupa-sakti is her extended self. The town of her beautiful service is the whole svarupa-sakti. Just as rays of light extend from the sun, the whole internal potency is an extension of Mahabhava, Sri Radhika. She has developed herself into such a beautiful area of brilliance, of internal energy, and thereby she serves her Lord. All these necessary things have sprung from her. To help her in serving her Lord, they all come out. When the entire internal energy is condensed in a concise form, it is Mahabhava, Radharani. And when Radharani wants to serve, she extends herself in limitless different ways. And with some contribution from Baladeva and Yogamaya, the whole spiritual world, including Vrndavana, Mathura, and Vaikuntha, evolves to assist Srimati Radharani in the service of Sri Krsna. In this way, I have drawn out radha-dasyam, the service of Srimati Radharani as the meaning of the gayatri mantra and have tried to represent it in the above Sanskrit verse.